Egyptian stocks dropped on Sunday, hurt by two deadly bomb attacks on two Coptic churches on Palm Sunday, in the latest assault on a religious minority increasingly targeted by Islamic State. The bombings, which killed at least 36 people and injured more than 100 others, happened weeks before Pope Francis was to visit Egypt. Cairo main index, EGX 30 closed 1.55 percent lower, to 12,895 points. “This was an immediate (market) reaction to the terrorist attack,” Ahmed Abu Taleb, head of sales at Pharos Securities in Cairo, told Reuters. Islamic State’s news agency Amaq said later that the group was responsible for two church bombings in Egypt on Sunday. “A group that belongs to Islamic State carried out the two attacks on the churches in the cities of Tanta and Alexandria,” Amaq said. The first bombing, in Tanta, a Nile Delta city less than 100 kilometres outside Cairo, killed at least 25 and injured at least 78, according to Egypt’s Ministry of Health. The second, carried out just a few hours later by a suicide bomber in Alexandria, hit the historic seat of the Coptic Pope, killing 11, including three police officers, and injuring 35, the ministry added. Abu Taleb said the Egyptian stock index has traded between 12,800 and 13,400 points for the past three months, but he added prospects for the market are brighter due to a stable currency, increasing flow of tourists and inflation that is expected to peak. “At the macro level things are looking okay, slightly improving,” he said. Egyptian stocks are still up nearly 4.5 percent this year as confidence has returned to the market after the country let the currency float freely last year. In 2016, Egyptian stocks surged 76 percent. Other indices; EGX50 EWI index also fell 0.94 percent, to 2,082 points; EGX20 edged down 1.41 percent, to 12,229 points. Mid- and small-cap index EGX70 rose 0.08 percent, to 587 points. Price index, EGX100 plummeted 0.26 percent, to 1,349 points. 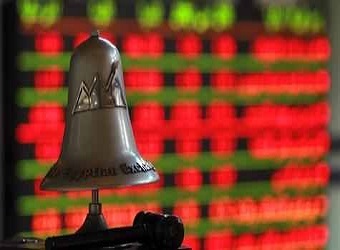 Market capitalisation incurred losses worth 6.9 billion Egyptian pounds (around $383.4 million), to record 657.416 billion pounds during the closing session of Sunday. The bourse’s trading volume reached 346.569 million securities, with turnovers, closing at 1.934 billion pounds, exchanged through 33,949 transactions. Also during the closing session, 188 listed securities have been traded in, 104 declined, 64 advanced; while 17 kept their previous levels. Local investors were net sellers capturing 71.53 percent of the total market, with a net equity of 841.477 million pounds, excluding the deals. On the contrary, non-Arab foreign investors and Arab investors were net buyers controlling 17.44 and 11.03 percent respectively of the total markets, with a net equity of 501.355 million pounds and 340.121 million pounds, respectively, excluding the deals.